• Selected by Golden State as an early entry candidate in the first round of the 2009 NBA Draft (7th overall). • Signed a contract extension with Golden State on October 31, 2012. • Named the 2014-15 Kia NBA Most Valuable Player, becoming the second player in Warriors history to be named MVP—and the first in the team’s West Coast Era (since 1962-63). • Was a unanimous First Team All-NBA selection in 2014-15, becoming the first Warrior to be named to the First Team since Latrell Sprewell in 1993-94. • Earned All-NBA Second Team honors in 2013-14, becoming first Warriors player named to First or Second Team since 1993-94. • Is a two-time NBA All-Star (2014 & 2015), having been voted by fans to start the game in both seasons. • Finished runner-up for 2009-10 NBA Rookie of the Year Award and was unanimous First Team All-Rookie selection. • Set an NBA-record with 286 threes in 2014-15, breaking his own mark of 272 threes set in 2012-13. • Owns three of the time five single-season three-point totals in NBA history, ranking first (286, 2014-15), second (272, 2012-13) and fifth (261, 2013-14) on the all-time list. • Ranks third on the NBA’s all-time three-point percentage list with a career-mark of 44.0 percent from distance (first among active players), behind only current Warriors Head Coach Steve Kerr (.454) and Hubert Davis (.441). • Ranks third on the NBA’s all-time free throw percentage list with a career-mark of 90.0 percent (first among active players), which trails only Steve Nash (.904) and Mark Price (.904) in league annals. • Has won two FIBA gold medals as a part of the USA Men’s Basketball Senior National Team, having represented at the 2010 FIBA World Championships in Turkey and the 2014 FIBA Basketball World Cup in Spain. • Hit a franchise record 93.4 percent from the free throw line in 2010-11 and was the first Warrior to lead the league in the category since Mark Price shot 90.6 percent in 1996-97. • Enters 2015-16 owning career averages of 20.9 points, 4.1 rebounds, 6.9 assists, 1.72 steals and 35.0 minutes while shooting 47.1 percent from the field and 44.0 percent from three-point range in 416 regular-season games (410 starts) over six seasons with Golden State. • On the Warriors’ all-time career leaders lists, enters the 2015-16 season ranked tied for first in free throw percentage (.900), first in three-pointers made (1,191), second in three-point percentage (.440), fourth in steals (717), sixth in assists per game (6.9) and sixth in total assists (2,866). • Has recorded five career triple-doubles, which is tied for the third most all-time in Warriors history. • Has appeared in 40 playoff games (all starts) with Golden State, averaging 25.9 points, 4.4 rebounds, 7.3 assists and 1.78 steals in 40.5 minutes and helping Golden State to the 2014-15 NBA Championship. • Among the Warriors’ all-time playoff leaders, ranks first in three-point field goals (162), second in assists (290), second in steals (71), fourth in three-point percentage (.410), fifth in points (1,036), fifth in field goals made (353), fifth in free throw percentage (.862) and sixth in free throws (168). • Is the only player in franchise history to average at least 23 points and eight assists in multiple postseasons. 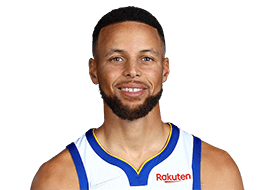 • Named the 2014-15 Kia NBA Most Valuable Player, becoming the second player in Warriors history to be named MVP—and the first in the team’s West Coast Era (since 1962-63)—joining Wilt Chamberlain, who earned the honor as a rookie with the Philadelphia Warriors in 1959-60. • Over 80 games (all starts), averaged 23.8 points, 7.7 assists, 4.3 rebounds and 2.04 steals in 32.7 minutes. • Was a unanimous First Team All-NBA selection, becoming the first Warrior to be named to the First Team since Latrell Sprewell in 1993-94... Curry was joined on the All-NBA Team by backcourt mate Klay Thompson (Third Team), making the pair the first backcourt duo to receive All-NBA honors since Seattle’s Gus Williams and Dennis Johnson both made the Second Team in 1979-80. • Ranked sixth in the NBA in scoring, fourth in steals, first in free throw percentage (.914), sixth in assists, third in three-point percentage, first in plus/ minus (+11.5) and first in Net Rating (17.0). • Has led the NBA in three-pointers in each of the past three seasons, the first player to lead the league in the category in three consecutive campaigns. • Hit his 273rd three-pointer of the season on 4/9 vs. Portland to break his own NBA record for most threes in a single season... Recorded his first career 40-point/10-assist regular season game in that contest, scoring 45 points on 17-of-23 shooting (.739) to go with 10 assists, the first regular season 40-point/10-assist game by a Warrior since Baron Davis in 2005. • Notched 17 30-point games, three 40-point games and one 50-point game. • Posted 23 double-doubles (22 point/assist), 16 20/10 games (15 point/assist), six 30-point/10-assist games and one 40-point/10-assist game. • Dating back to 11/13/14, has hit a three-pointer in 73-straight regular season games, the second-longest such streak of his career. • Dating back to 11/9/13, has connected on a three-pointer in 74-straight regular season road games, the second-longest such streak in NBA history... Hit a three in 38-straight home games, the longest home three-point streak of his career. • Posted a 50-7 (.877) record as a starter along with Harrison Barnes, Andrew Bogut, Draymond Green and Klay Thompson, comprising the team’s best five-man unit (min. 20 games) since the NBA began tracking starters in 1970-71 and the second-best starting five (min. 40 games) in NBA history, behind only the 1995-96 Chicago Bulls. • When he recorded 20 points and 10 assists, the Warriors were 14-1 on the season. • Shot 51.7 percent from three-point range following the All-Star Break. • Hit 52 consecutive free throws without a miss, a career-long streak (3/9-4/4). • In his 400th career start on 3/27 at Memphis, recorded his 700th career steal, becoming the fifth player in franchise history with at least 700 steals. • Won the Three-Point Contest at NBA All-Star Saturday Night with an event record score of 27, making 13 consecutive threes in the final round. • Had an NBA-record streak of four-straight games with at least five threes and five assists from 3/1-3/6. • Scored a season-high 51 points, his highest scoring output at home in his career and second career 50-point game, on 2/4 vs. Dallas... Set career-highs in scoring in a half (36, second) and a quarter (26, third)… Became the sixth player in franchise history to record multiple 50-point games in his career and the second player in NBA history to hit at least 10-three pointers in multiple games (J.R. Smith has done so three times). • Was the NBA’s leading vote-getter for the NBA All-Star Game, receiving 1,513,324 votes in being named a starter on the Western Conference All-Star team for a second consecutive season... Became the first Warrior since Rick Barry in 1976 to lead the league in All-Star voting and the first since Chris Mullin (1991 & 1992) to start in consecutive All-Star games. • Hit 200 threes for a third-straight season, joining Ray Allen (five seasons) as the only players to hit at least 200 threes in at least three different seasons. • Became the fastest player in NBA history to hit 1,000 career threes on 1/7 vs. Indiana... Playing in his 369th game, Curry reached the 1,000 milestone in 88 fewer games than Dennis Scott, who had previously been the fastest (457 games), becoming the 74th player in NBA history to hit that mark (13th with same franchise). • Logged his 20th career 30/10 game with 32 points and 12 assists on 1/2 vs. Toronto, becoming the first player since Chris Paul in Jan. 2009 to post those figures without a turnover... It was the third time in his career that he posted double-digit assists with no turnovers. • Hit the game-winning three-pointer with 2.2 seconds remaining on 12/2 vs. Orlando (his fourth career game-winner), giving the Warriors a one-point win. • Named Western Conference Player of the Month for games played in Oct./Nov., his third career monthly award, posting averages of 23.8 points, 7.8 assists, 5.3 rebounds and 1.94 steals in 32.4 minutes over 16 games during the season’s opening month. • Finished the season with 72 such games for his career. • Scored 40 points on 12-of-19 shooting (.632), hitting 6-of-8 from three (.750), to go along with eight assists on 11/25 at Miami. • Was named Western Conference Player of the Week for the first time in his career for games played 11/3-11/9, averaging 30.0 points, 7.3 assists, 6.0 rebounds and 3.3 steals during the week... It marks the first time in Warriors franchise history they’ve had two different players earn the honor in consecutive weeks after Klay Thompson won the award a week prior. • Registered his fifth career point/rebound double-double and second of the season on 11/8 at Houston, scoring 34 points and grabbing 10 rebounds. • Together with Klay Thompson on 11/1 vs. the L.A. Lakers, combined for 72 points on 37 field goal attempts, the first time in NBA history (since starters were tracked in 1970-71) that a pair of starting backcourt mates combined for that many points on 37 or fewer attempts. • Missed one game due to rest and one game due to right foot soreness. • Appeared in 21 postseason games, averaging 28.3 points, 6.4 assists, 5.0 rebounds and 1.86 steals in 39.3 minutes per game. • Hit 98 three-pointers in the 2015 Playoffs, breaking Reggie Miller’s NBA record for threes in a single postseason (58 set in 2000). • Recorded nine 30-point games (14 career) and two 40-point games (three career) in the 2015 Playoffs. • Has hit a three-pointer in 40-straight playoff games (every postseason game in which he has appeared)... Has hit multiple threes in 26-straight playoff games, an NBA-best streak. • Scored 37 points on 6/14 vs. Cleveland, the most points by a Warrior in the NBA Finals since Rick Barry scored 38 points on May 23, 1975 vs. Washington. • Is the fifth player in franchise history to reach the 1,000-point mark for his postseason career, joining Barry, Wilt Chamberlain, Paul Arizin and Jeff Mullins. • Is the first player in NBA Finals history to hit at least seven threes in multiple games in a single Finals series. • Scored his 522nd point of the 2015 Playoffs on 6/11 at Cleveland, passing Rick Barry (521 in the 1967 Playoffs) for most points scored in a single postseason in franchise history. • Connected on 25 three-pointers in the NBA Finals against Cleveland, setting the NBA record for most threes made in a six-game Finals series. • Made 27 three-pointers in the Western Conference Finals against Houston, setting the NBA record for most threes made in a five-game series. • Scored 40 points on 5/23 at Houston, becoming the first Warrior with multiple 40-point games in a single postseason since Rick Barry in 1976. • Scored at least 30 points in four-straight postseason games (5/15-5/23), becoming the first Warrior to string together four-straight 30-point games in the playoffs since Rick Barry in 1967. • Hit 26 three-pointers in the Western Conference Semifinals against Memphis, breaking his own NBA record for most three-pointers made in a six-game series. • Connected on a playoff career-high eight three-pointers on 5/15 at Memphis... Recorded his first 30/10 game of the postseason (third of his playoff career) in that contest, finishing with 32 points and 10 assists. • Became the fastest player in NBA history to hit 100 postseason three-pointers on 5/13 vs. Memphis, reaching the mark in 28 playoff games and besting Ray Allen’s record of 100 three-pointers in 35 postseason games... Tallied a playoff career-high six steals in that contest, becoming the first player in NBA history to notch six thefts and six three-pointers in a playoff game. • Joins Wilt Chamberlain, Rick Barry, Paul Arizin and Chris Mullin as the only players in Warriors history to post multiple 40-point games in their postseason careers. • Hit 20 three-pointers in the First Round against New Orleans, an NBA record for most three-pointers made in a four-game series. • Hit the game-tying three-pointer with 2.8 seconds remaining to force overtime on 4/23 at New Orleans... Hit a then-playoff career-high-tying seven threes on 18 attempts in that contest, tying an NBA-record for three-point attempts in a playoff game (held by Ray Allen, who hit 9-of-18 on 4/30/09). • Appeared in 78 games (all starts), averaging career highs of 24.0 points (seventh in the NBA) and 8.5 assists (fifth) to go with 4.3 rebounds and 1.63 steals, becoming the first player in Warriors history to average 24 points and eight assists in a single season (ninth player in NBA history). • Led the league in three-pointers made for a second consecutive season with 261 (fourth-most ever in a single season), the first player since Ray Allen in 2001-02 and 2002-03 to lead the league in threes in back-to-back seasons. • Finished tied for fifth in free throw percentage (.885) and eighth in three-point percentage (.424). • Led the league in 30-point/10-assist games (10) and 20-point/10-assist games (18) while becoming the first player in Warriors history to tally four 30-point/15-assist games, the most in a single season by any player since John Stockton had four in 1989-90. • Tied for second in the NBA in triple-doubles with four, the most by a Warrior in a single season since Wilt Chamberlain had five in 1963-64. • Set new single-season career-highs with 23 30-point games, three 40-point games and 27 double-doubles. • Earned All-NBA Second Team honors, becoming first Warriors player named to First or Second Team since 1993-94. • Finished the season by scoring at least 30 points in three consecutive games for the first time in his career. • Was named Western Conference Player of the Month for April after averaging 26.4 points, 9.9 assists, 3.6 rebounds and 2.38 steals in 36.0 minutes over eight games, joining Chris Mullin as only players in franchise history to receive NBA’s monthly honor twice (also April 2013). • Scored a season-high 47 points on 4/13 at Portland for his third 40-point game of the year, joining Kyrie Irving as the only guards to score 40-plus three times. • Tallied 30 points, 12 assists and 10 rebounds on 4/11 at the L.A. Lakers for his fifth career triple-double, including his fourth in 2013-14. • With 31 points and a career-high-tying 16 assists in just 29 minutes on 4/6 vs. Utah, became the first player in NBA history to post a 30/15 game in fewer than 30 minutes. • Hit his third career game-winner (final three seconds) with 0.1 second remaining in overtime on 4/1 at Dallas. • Recorded his fourth career triple-double with 27 points, 11 rebounds and 11 assists in 30 minutes on 2/28 at New York, becoming just the fifth player (second visiting) to post a 50-point game (54 points on 2/27/13) and a triple-double in separate games at Madison Square Garden since it was moved to its present location in 1968. • Was named the Warriors first All-Star Game starter since Latrell Sprewell in 1995, starting and playing in his first All-Star Game on 2/16 in New Orleans, finishing with 12 points and 11 assists in 28 minutes, the first point/assist double-double ever by a Warrior in the All-Star Game... Was one of four players to garner over 1 million votes (LeBron James, Dwyane Wade, Paul George) for the All-Star Game and was the first Warrior to lead his position group in voting since Rick Barry led all Western Conference forwards in 1976. • Scored 44 points on 1/31 at Utah, hitting 8-of-13 from deep. • Tallied at least 24 points and seven assists in six consecutive games from Jan. 15-26, the longest such streak in Warriors history. • Hit the game-winner with 2.1 seconds remaining on 1/10 vs. Boston. • Notched his second triple-double of the season on 12/27 vs. Phoenix, scoring 14 points while setting career-highs in rebounds (13) and assists (16) in 34 minutes, becoming the first Warrior to post those figures in a game since Guy Rodgers (23 points, 20 rebounds, 17 assists) on 10/26/62 vs. Detroit, the Warriors’ second game in the Bay Area. • Hit the game-winning shot with 3.0 seconds to play on 12/11 vs. Dallas. • Became the franchise’s career three-point leader on 12/7 at Memphis, passing Jason Richardson’s mark of 700 threes in a Warriors uniform. • Scored 43 points on 12/9 at Charlotte to go with nine assists. • Recorded his first triple-double of the season on 11/4 at Philadelphia, tallying 18 points, 12 assists and 10 rebounds in 29 minutes, the first player to record a triple-double in under 30 minutes on the road since Portland’s Damon Stoudamire on 4/6/01 at Golden State... Curry added five steals, becoming the second player in NBA history to post a line of 18/12/10/5 in a game, joining Fat Lever, who did so twice in 1987 (steals became an official stat in 1973-74). • Hit a season-high nine threes on 10/31 at the Clippers. • At 2014 NBA All-Star Weekend, also participated in the Three-Point Contest (third career appearance) as well as the Shooting Stars competition (alongside his father, Dell), the first Warrior ever to take part in that event. • Missed one game (11/8) with a left ankle bone bruise, two games with a mild concussion (11/20-11/22), and one game to rest (4/16). • In seven postseason games, averaged 23.0 points, 8.4 assists, 3.6 rebounds and 1.71 steals in 42.3 minutes. • Scored 33 points twice in the playoffs (Game 4 vs. LAC and Game 7 at LAC), giving him five 30-point playoff performances in his career (one of only seven Warriors to have five such games on their playoff resume). • Hit a career-high 16 free throws in Game 7 on 5/3 at the Clippers, tying a Warriors playoff record held by Chris Mullin while setting the club record for most free throws made without a miss in a postseason game. • Hit a new postseason career-high with seven threes in Game 4 on 4/27 vs. the Clippers, including five in the first quarter to tie a Warriors postseason quarter record...Also grabbed a playoff-best seven rebounds. • Dished out a postseason career-high 15 assists in Game 3 on 4/24 vs. the Clippers, becoming the first Warrior to dish out 15 assists in a playoff game since Tim Hardaway totaled 20 on 5/14/91 at the Lakers. • Appeared in 78 games (all starts), averaging career highs of 22.9 points (seventh in NBA) and 6.9 assists (T-15th) to go with 4.0 rebounds and 1.62 steals in 38.2 minutes (seventh). • Ranked third in the league in three-point percentage (.453) and tied for second in free throw percentage (.900). • Established a new NBA single-season three-point record by draining 272 three-pointers, eclipsing the previous mark set by Ray Allen (269 in 2005-06), doing so on 53 less attempts than Allen did with Seattle. • Broke the Warriors’ single-season franchise record for three-pointers, previously held by Dorell Wright (194) in 2010-11, by 78 threes. • Became the only player in NBA history to hit 250 three-pointers and dish out 500 assists in a single season and the only player to average at least 3.0 threes and 6.0 assists. • Became first player in NBA history to hit 45.0 percent-or-better from three-point range while attempting at least 7.0 treys per game. • Became the second player in league history to hit 200-or-more threes on 45 percent-or-better shooting, joining Glen Rice, who did so in 1995-96. • Was one of just four players in the league to average at least 22 points, six assists and four rebounds (along with LeBron James, Kobe Bryant and Russell Westbrook) and is one of four Warriors ever to do so (Latrell Sprewell, Tim Hardaway and Rick Barry). • Earned Western Conference Player of the Month honors for the month of April, averaging 25.4 points, 8.1 assists, 3.9 rebounds and 2.13 steals in eight games in the final month of the season to become the third Warrior to ever win the award, joining Chris Mullin (November 1990 & January 1989) and Bernard King (January 1981). • Averaged 26.0 points after the All-Star Break, which ranked fourth in the league over that span behind only Carmelo Anthony, Kobe Bryant and Kevin Durant. • Tallied two of the NBA’s top six scoring games with 54 points on 2/27 at New York and 47 on 4/12 at Los Angeles, becoming the first Warrior to score 45-plus at New York and L.A. in the same season since Rick Barry in 1966 (joining Barry, Guy Rodgers and Wilt Chamberlain as the only four Warriors to do so). • Scored a career-high 54 points that included a career-best and franchise-record 11 three-pointers on 2/27 at New York, becoming the first player in NBA history to score 50-plus points while hitting 10-plus three-pointers in a game. • 54-point effort was highest in the league in 2012-13 and the most scored by a Warrior since Purvis Short tallied 59 points on 11/17/84 vs. New Jersey (only Short, Wilt Chamberlain, Rick Barry and Joe Fulks have recorded higher scoring games in Warriors history). • Became the 13th player in NBA history to put together a 50-point game at Madison Square Garden. • Since MSG re-opened in 1968 at its present location, only two other visiting players, Kobe Bryant (61 points) and Michael Jordan (55 points), have scored more than Curry’s 54 points. • Totaled 47 points, nine assists, six rebounds and three steals (shooting 17-of-31 from the field, 9-of-15 from three) on 4/12 at the Lakers, becoming the first player since Dwyane Wade (3/14/09 vs. Utah) and the first Warrior since Rick Barry (3/25/78 vs. NY) to post at least 47 points, nine assists, six rebounds and three steals in a game. • Scored 20-plus 54 times, 30-plus 14 times, 40-plus twice and 50-plus once. • Hit 17 three-pointers in the Foot Locker Three-Point Contest at All-Star Weekend in Houston, but was eliminated in the first round. • In 12 playoff games (all starts), averaged 23.4 points (5th in the NBA), 8.1 assists (2nd) and 3.8 rebounds, becoming the second Warrior to average 23 points and eight assists in a single postseason (Tim Hardaway, 1991). • Set a new franchise record with 42 three-pointers, eclipsing the Warriors’ career playoff mark of 29 previously held by Jason Richardson, giving him a total of 314 three-pointers in the regular season (272) and postseason to become the first player in NBA history to hit at least 300 threes in a single season. • Hit 23 threes in the Warriors’ First Round series vs. Denver, establishing a new NBA record for three-pointers in a six-game series (Warriors won 4-2). • Had consecutive games of at least 25 points and 10 assists on 4/23 and 4/26 vs. Denver, becoming the first Warrior ever to post consecutive 25-point/10-assist games. • Tallied 44 points and 11 assists in a franchise playoff-record 58 minutes in Game 1 of Western Conference Semifinals series at San Antonio on 5/6, becoming the first player with at least 44 points and 11 assists in a playoff game since Michael Jordan did so on 5/13/90 at Philadelphia and the first 40/10 game by a Warrior in the playoffs since Eric “Sleepy” Floyd tallied 51 points and 10 assists on 5/10/87 vs. the Lakers (first 40-point playoff game since Chris Mullin had 41 on 5/8/91 at the Lakers). • Averaged a league-best 9.2 points in the third quarter during the postseason. • During the postseason, scored 20-plus eight times, 30-plus three times and 40-plus once... The Warriors were 6-2 when Curry scored 20-plus points and 0-4 when he did not... Had three double-doubles, including a 20/10, 30/10 and 40/10 performance. • Appeared in 26 games (23 starts), averaging 14.7 points, 3.4 rebounds, 5.3 assists and 1.50 steals in 28.2 minutes per contest. • Ranked tied for second in the NBA in three-point percentage, hitting a career-best .455 from long range. • Posted career-highs in field goal percentage (.490) and three-point percentage (.455) to go with an .809 mark from the free throw line, becoming just the second player in NBA history to hit at least 46.0 percent from the field, 43.0 percent from three-point land and 80.0 percent from the free throw line in three consecutive seasons (joining Steve Nash, who did so in five-straight seasons from 2004-05 to 2008-09) and the only player to accomplish the feat in his first three seasons in the league. • His three-point percentage (.455) ranked as the fourth-best single-season percentage in franchise history. • Posted season highs of 36 points on 13 made field goals (six threes) in 40 minutes on 2/18 at Memphis...Also scored 36 points on 2/9 at Denver...Dished out a season-high 12 assists on 2/2 vs. Utah and swiped a season-best six steals on 12/26 vs. Chicago. • One of only seven players to post multiple games with at least 36 points and six assists (joining LeBron James, Russell Westbrook, Kobe Bryant, Tony Parker, Chris Paul and Deron Williams). • Posted 32 points, seven assists, six rebounds and four steals on 1/25 vs. Portland, one of only four players to tally those figures in a game (joining LeBron James, Monta Ellis, John Wall). • Tallied 21 points, 10 assists, seven rebounds and six steals on 12/26 vs. Chicago, making him one of only two players to post those figures in a game (John Wall) and one of only three active players to have posted those numbers in multiple games in a career (Jason Kidd and Chris Paul). • Scored 10-plus points 19 times, 20-plus seven times, 30-plus three times and dished out 10-plus assists three times (all double-doubles) and had two 20-point/10-assist games. • Missed 40 games due to injury, including the last 28 games (3/13-4/26) with a sprained right ankle and subsequent surgery on the ankle (performed 4/25)...Also missed nine previous games with a sprained right ankle (12/28, 1/6-1/18) and three with a strained tendon in his right foot (2/28, 3/2-3/4). • Appeared in 74 games (all starts), averaging 18.6 points, 3.9 rebounds, 5.8 assists and 1.47 steals in 33.6 minutes per contest. • Among NBA leaders, ranked first in free throw percentage (.934), third in three-point percentage (.442), 15th in steals, 21st in assists and 26th in scoring. • Free throw percentage of .934 (212-227 FT) established new Warriors single-season record, surpassing previous mark of 92.4 percent set by Rick Barry in 1977-78. • Became first Warriors player to lead the NBA in free throw percentage since Mark Price shot 90.6 percent in 1996-97. • For the second consecutive season, shot better than 45.0 percent from the field, 40.0 percent from three-point range and 85.0 percent from the line, becoming the first player to accomplish the feat in his first two NBA campaigns. • Among all second-year players, ranked first in scoring, first in steals, first in free throw percentage, first in three-point percentage, second in assists and third in field goal percentage. • Tallied 33 points and a career-high 11 rebounds at Minnesota (2/27). • Registered 23 points and a season-high 13 assists vs. Oklahoma City (2/13). • Posted a season-high 39 points & a then-career-high 14 field goals (on 20 FGA) at Oklahoma City (12/5). • Registered 20-or-more points 35 times, including seven 30-plus performances. • Tallied 10-or-more assists six times...Five double-doubles (one point/rebound). • Won the Taco Bell Skills Challenge at NBA All-Star Saturday Night 2011 in Los Angeles, completing the obstacle course in 28.2 seconds. • Became the first Warriors player to participate in the Skills Challenge after being voted into competition by fans. • Registered 13 points, eight assists and six rebounds in 28 minutes as a member of the Sophomore squad in the T-Mobile Rookie Challenge at NBA All-Star 2011 in Los Angeles, a game won by the Rookies 148-140. • Missed eight games due to a sprained right ankle (two games from 10/31 - 11/3 & six games from 12/10 - 12/21). • Appeared in 80 games (77 starts), averaging 17.5 points, 4.5 rebounds, 5.9 assists and 1.90 steals in 36.2 minutes. • Among NBA leaders, finished the season ranked third in the NBA in steals per game, seventh in three-point field goal percentage (.437), ninth in free throw percentage (.885), 13th in assists and 34th in scoring. • Among rookies, ranked first in assists, first in steals, first in three-point percentage, first in free throw percentage, second in scoring, second in minutes, eighth in rebounding and 10th in field goal percentage (.462). • Was named Western Conference Rookie of the Month for January (19.1 ppg, 4.4 rpg, 5.5 apg and 2.00 spg), March (19.8 ppg, 4.3 rpg, 7.3 apg and 1.79 spg) and April (26.4 ppg, 6.4 rpg, 8.1 apg and 2.63 spg)...Was only Western Conference Rookie to win award three times. • Finished runner-up for the NBA Rookie of the Year Award and was unanimous First Team All-Rookie selection, becoming the first Warriors player since Jason Richardson in 2001-02 to earn All-Rookie First Team honors. • From January 1 until the end of the season (49 games), averaged 21.1 points, 4.9 rebounds, 6.8 assists and 1.94 steals in 38.9 minutes...His scoring average ranked tops among all rookies from January 1 through the end of the season. • Became the only rookie in NBA history to shoot at least 45.0 percent from the field, 40.0 percent from three-point range and 85.0 percent from the free throw line for a season (minimum 100 FTM and 100 3FGM). • Registered 27 points, 14 assists, eight rebounds and seven steals at Minnesota (4/7), becoming just the third player, and first rookie, in NBA history to post at least those numbers in each category in the same game, joining Chris Paul and Micheal Ray Richardson. • Had five 30-point/10-assist games, which tied Michael Jordan for the second-most 30-point/10-assist games by a rookie (Oscar Robertson is first with 25)...No other rookie posted one 30/10 game in 2009-10. • Became just the sixth rookie in NBA history to post a 35-point, 10-assist, 10-rebound game when he registered 36 points, 13 assists and 10 rebounds in his first career triple-double vs. L.A. Clippers (2/10)...Only other rookies to accomplish this were Michael Jordan, Oscar Robertson, Jerry West, Elgin Baylor and Jason Kidd. • In season finale at Portland (4/14), had then-career-high 42 points, nine rebounds and eight assists, becoming the first rookie since Oscar Robertson in February 1961 to register at least those numbers in each category in the same game. • Drained 166 three-pointers, which were the most ever by a rookie in NBA history. • Went 6-for-6 from long range at Denver (1/5), which tied the Warriors all-time franchise record for most made three-pointers without a miss in one game. • Scored 30-plus points eight times...It was the most 30-point games by any rookie in 2009-10 and the third most by a rookie since Tim Duncan had eight in 1998 (LeBron James had 13 and Carmelo Anthony had 10 in 2003-04). • Registered 13 games with at least 25 points, five rebounds and five assists, which were the most 25/5/5 games by any rookie in 2009-10. • Tallied 20-plus points 27 times, 30-plus points eight times and 40-plus points once. • Missed two games with a sprained left ankle. • Participated in the Three-Point Contest during All-Star Weekend at Cowboys Stadium in Dallas and placed second behind Paul Pierce of the Celtics... Also played in the Rookie Challenge during the All-Star break and posted 14 points (6-11 FG) in 23 minutes in a winning effort for the Rookies. • Was starting guard for the 2014 USA Men’s Basketball Senior National Team that went 9-0 en route to the gold medal at the 2014 FIBA Basketball World Cup in Spain...In nine games, averaged 10.7 points, 2.8 rebounds, 2.9 assists and 1.22 steals. • Was a member of the 2010 USA Men’s Basketball Senior National Team that went 9-0 and won the gold medal at the 2010 FIBA World Championships in Turkey...Appeared in eight of Team USA’s games during the World Championships, averaging 4.6 points, 1.4 rebounds and 2.1 assists in 10.6 minutes per contest. COLLEGIATE HIGHLIGHTS WITH DAVIDSON: •Appeared in 104 games over three seasons at Davidson, averaging 25.3 points, 4.5 rebounds, 3.7 assists and 32. 6 minutes, shooting 46.7 percent from the field, 41.2 percent from three-point range and 87. 6 percent from the free throw line. •Finished his collegiate career ranked 25th all-time on the NCAA Division I scoring list with 2,635 points. •Completed his collegiate career ranked fourth on NCAA’s all-time list for career three-pointers with 414. •NCAA single-season record holder with 162 three-pointers in 2007-08. •Left school as Davidson’s and Southern Conference’s all-time leader in scoring. •Owns Davidson career records in three-pointers (414), free throws (479), 30-point games (30) and 40-point games (six). •Named Consensus First-Team All-American as a junior and Consensus Second-Team All-American as a sophomore. •Named John R. Wooden Award All-American as a sophomore and junior. •Named Southern Conference Player of the Year as a sophomore and junior. •Named Southern Conference Player of the Week 16 times and SoCon Men’s Basketball Athlete of the Month 11 times. •Scored in double-figures in every game of his career but two (102 games). •As a junior in 2008-09, led nation in scoring with 28.6 points to go along with 5.6 assists, 4.4 rebounds and 33.7 minutes in 34 games (all starts), becoming the first Davidson player to lead the nation in scoring. •Owns Davidson single-season records for points (974) and steals (86) as a junior. •As a sophomore in 2007-08, appeared in 36 games (all starts), averaging 25.9 points (4th in NCAA), 4.6 rebounds and 2.9 assists in 33.1 minutes... Led his team to the NCAA Tournament for the second consecutive season and, as the No. 10 seed, on a run to the Elite Eight. •Named NCAA Tournament Midwest Regional Most Outstanding Player and named to All-Region team after helping Davidson advance to the Elite Eight as a sophomore. •As a freshman in 2006-07, appeared in 34 games (33 starts), averaging 21.5 points, 4.6 rebounds and 2.8 assists in 30.9 minutes, leading the team to the NCAA Tournament... Ranked ninth nationally in scoring and second among freshmen behind Kevin Durant of Texas. PERSONAL: First name is pronounced STEFF-in... He and his wife, Ayesha, have two daughters, Riley and Ryan... Parents are Dell and Sonya Curry... Has two siblings, Seth and Sydel... Father, Dell, was a star at Virginia Tech and went on to play 16 seasons in the NBA for five different teams, including a 10-year stint with the Charlotte Hornets... Dell is currently a broadcaster for the Charlotte Hornets... Mother, Sonya, was a standout on the volleyball team at Virginia Tech... Brother, Seth, played much of his rookie season in 2013-14 with the Santa Cruz Warriors and is currently a member of the Dallas Mavericks after appearing in 44 games (nine starts) with the Sacramento Kings in 2015-16... Sister, Sydel, is currently a volleyball player at Elon University... Had his #20 retired by his high school, Charlotte Christian School, and the student section at Davidson College named “Section 30” in his honor in dual ceremonies when the Warriors traveled to Charlotte in January 2017... Together with Andre Iguodala, led the inaugural Players Technology Summit, presented by Bloomberg, in August 2017 in San Francisco, which brought together top leaders in the technology, venture capital and sports communities to exchange ideas and share expertise... In the summer of 2016, spoke at TechCrunch Disrupt and participated in the NBPA’s first-ever Technology Summit in San Francisco... Won the 2013-14 Kia Community Assist Seasonlong Award in recognition of his remarkable charitable contributions, fundraising and generosity in the Bay Area and across the globe... Since his college days at Davidson, has been a champion of the United Nations Foundation’s Nothing But Nets campaign, which distributes live-saving, insecticide-treated mosquito nets to protect families across Africa from malaria... Has donated three bed nets for every three-pointer he made during each of the last five seasons as part of his Three-For-Three Challenge... In July of 2013, traveled to Tanzania with a group from Nothing But Nets and helped distribute 38,000 bed nets to families at the Nyarugusu Refugee Camp... Met President Barack Obama after giving a speech at the White House in support of the President’s Malaria initiative in February 2015... In the summer of 2017, traveled with Under Armour to Beijing, Chengdu and Hangzhou in China and Seoul, South Korea, marking his third-straight summer trip to Asia... In the summer of 2016, traveled to Shenyang, Guangzhou, Hong Kong and Taipei as part of a four-city, five-day Under Armour Basketball Tour of Asia... An avid golfer, competed in the Web.com Tour’s Ellie Mae Classic at TPC Stonebrae on an unrestricted sponsor exemption in August 2017, shooting a 74 on both days... Has played in the American Century Championship celebrity golf tournament in South Lake Tahoe multiple times, including a fourth-place finish in 2013, which was the best finish among all active professional athletes... Has hosted the SC30 Select Camp each of the last four summers, inviting 20 top high school prospects for a four-day, hands-on training session... Is very active on social media, interacting with fans and sponsoring #SC30 contests where he gives prizes to fans who provide the best responses to his online challenges.